For other senses of this term, see AC adapter. This unit charges the batteries until they reach a specific voltage and then it trickle charges the batteries until it is disconnected. A simple charger equivalent to an AC/DC wall adapter. It applies 300 mA to the battery at all times, which will damage the battery if left connected too long. The charging protocol (how much voltage or current for how long, and what to do when charging is complete, for instance) depends on the size and type of the battery being charged. Some battery types have high tolerance for overcharging (i.e., continued charging after the battery has been fully charged) and can be recharged by connection to a constant voltage source or a constant current source, depending on battery type. Simple chargers of this type must be manually disconnected at the end of the charge cycle, and some battery types absolutely require, or may use a timer, to cut off charging current at some fixed time, approximately when charging is complete. Other battery types cannot withstand over-charging, being damaged (reduced capacity, reduced lifetime), over heating or even exploding. The charger may have temperature or voltage sensing circuits and a microprocessor controller to safely adjust the charging current and voltage, determine the state of charge, and cut off at the end of charge. Slow battery chargers may take several hours to complete a charge. High-rate chargers may restore most capacity much faster, but high rate chargers can be more than some battery types can tolerate. Such batteries require active monitoring of the battery to protect it from overcharging. Electric vehicles ideally need high-rate chargers. For public access, installation of such chargers and the distribution support for them is an issue in the proposed adoption of electric cars. Charge and discharge rates are often given as C or C-rate, which is a measure of the rate at which a battery is charged or discharged relative to its capacity. The C-rate is defined as the charge or discharge current divided by the battery's capacity to store an electrical charge. While rarely stated explicitly, the unit of the C-rate is h−1, equivalent to stating the battery's capacity to store an electrical charge in unit hour times current in the same unit as the charge or discharge current. The C-rate is never negative, so whether it describes a charging or discharging process depends on the context. For example, for a battery with a capacity of 500 mAh, a discharge rate of 5000 mA (i.e., 5 A) corresponds to a C-rate of 10 (per hour), meaning that such a current can discharge 10 such batteries in one hour. Likewise, for the same battery a charge current of 250 mA corresponds to a C-rate of 1/2 (per hour), meaning that this current will increase the state of charge of this battery by 50% in one hour. Since the unit of the C-rate is typically implied, some care is required when using it to avoid confusing it with the battery's capacity to store a charge, which in the SI has unit coulomb with unit symbol C.
If both the (dis)charge current and the battery capacity in the C-rate ratio is multiplied by the battery voltage, the C-rate becomes a ratio of the (dis)charge power to the battery's energy capacity. For example, when the 100 kWh battery in a Tesla Model S P100D is undergoing supercharging at 120 kW the C-rate is 1.2 (per hour) and when that battery delivers its maximum power of 451 kW, its C-rate is 4.51 (per hour). All charging and discharging of batteries generates internal heat, and the amount of heat generated is roughly proportional to the current involved (a battery's current state of charge, condition / history, etc are also factors). As some batteries reach their full charge, cooling may also be observed. Battery cells which have been built to allow higher C-rates than usual must make provision for increased heating. But high C-ratings are attractive to end users because such batteries can be charged more quickly, and produce higher current output in use. High C-rates typically require the charger to carefully monitor battery parameters such as terminal voltage and temperature to prevent overcharging and so damage to the cells. Such high charging rates are possible only with some battery types. Others will be damaged or possibly overheat or catch fire. Some batteries may even explode. For example, an automobile SLI (starting, lighting, ignition) lead-acid battery carries several risks of explosion. A simple charger works by supplying a constant DC or pulsed DC power source to a battery being charged. A simple charger typically does not alter its output based on charging time or the charge on the battery. This simplicity means that a simple charger is inexpensive, but there are tradeoffs. Typically, a carefully designed simple charger takes longer to charge a battery because it is set to use a lower (i.e., safer) charging rate. Even so, many batteries left on a simple charger for too long will be weakened or destroyed due to over-charging. These chargers also vary in that they can supply either a constant voltage or a constant current, to the battery. Simple AC-powered battery chargers usually have much higher ripple current and ripple voltage than other kinds of battery chargers because they are inexpensively designed and built. Generally, when the ripple current is within a battery's manufacturer recommended level, the ripple voltage will also be well within the recommended level. The maximum ripple current for a typical 12 V 100 Ah VRLA battery is 5 amps. As long as the ripple current is not excessive (more than 3 to 4 times the battery manufacturer recommended level), the expected life of a ripple-charged VRLA battery will be within 3% of the life of a constant DC-charged battery. Fast chargers make use of control circuitry to rapidly charge the batteries without damaging any of the cells in the battery. The control circuitry can be built into the battery (generally for each cell) or in the external charging unit, or split between both. Most such chargers have a cooling fan to help keep the temperature of the cells at safe levels. Most fast chargers are also capable of acting as standard overnight chargers if used with standard NiMH cells that do not have the special control circuitry. To accelerate the charging time and provide continuous charging, an intelligent charger attempts to detect the state of charge and condition of the battery and applies a 3 stage charging scheme. The following description assumes a sealed lead acid traction battery at 25 °C. The first stage is referred to as "bulk absorption"; the charging current will be held high and constant and is limited by the capacity of the charger. When the voltage on the battery reaches its outgassing voltage (2.22 volts per cell) the charger switches to the second stage and the voltage is held constant (2.40 volts per cell). The delivered current will decline at the maintained voltage, and when the current reaches less than 0.005C the charger enters its third stage and the charger output will be held constant at 2.25 volts per cell. In the third stage, the charging current is very small 0.005C and at this voltage the battery can be maintained at full charge and compensate for self-discharge. Inductive battery chargers use electromagnetic induction to charge batteries. A charging station sends electromagnetic energy through inductive coupling to an electrical device, which stores the energy in the batteries. This is achieved without the need for metal contacts between the charger and the battery. Inductive battery chargers are commonly used in electric toothbrushes and other devices used in bathrooms. Because there are no open electrical contacts, there is no risk of electrocution. Nowadays it is being used to charge wireless phones. "smart" batteries with internal protection or supervision or management circuitry. "dumb" batteries, which lack any internal electronic circuitry. The problem is, the magnitude of "delta-V" can become very small or even non-existent if (very) high[quantify] capacity rechargeable batteries are recharged. This can cause even an intelligent battery charger to not sense that the batteries are actually already fully charged, and to continue charging. Overcharging of the batteries will result in some cases. However, many so called intelligent chargers employ a combination of cut off systems, which are intended to prevent overcharging in the vast majority of cases. Several companies have begun making devices that charge batteries based on human motions. One example, made by Tremont Electric, consists of a magnet held between two springs that can charge a battery as the device is moved up and down, such as when walking. Such products have not yet achieved significant commercial success. A pedal powered charger for mobile phones, fitted into desks has been created by a Belgian company WeWatt, for installation in public spaces, such as at airports, railway stations and universities have been installed in a number of countries on several continents. Some chargers use pulse technology in which a series of voltage or current pulses is fed to the battery. The DC pulses have a strictly controlled rise time, pulse width, pulse repetition rate (frequency) and amplitude. This technology is said to work with any size, voltage, capacity or chemistry of batteries, including automotive and valve-regulated batteries. With pulse charging, high instantaneous voltages can be applied without overheating the battery. In a Lead–acid battery, this breaks down lead-sulfate crystals, thus greatly extending the battery service life. Several kinds of pulse charging are patented. Others are open source hardware. Some chargers use "negative pulse charging", also called "reflex charging" or "burp charging". Such chargers use both positive and brief negative current pulses. There is no significant evidence, however, that negative pulse charging is more effective than ordinary pulse charging. Solar chargers convert light energy into low voltage DC current. They are generally portable, but can also be fixed mount. Fixed mount solar chargers are also known as solar panels. Solar panels are often connected to the electrical grid via control and interface circuits, whereas portable solar chargers are used off-the-grid (i.e. cars, boats, or RVs). Although portable solar chargers obtain energy from the sun only, they still can (depending on the technology) be used in low light (i.e. cloudy) applications. Portable solar chargers are often used for trickle charging, although some solar chargers (depending on the wattage), can completely recharge batteries. Other devices may exist, which combine this with other sources of energy for added recharging efficacy. The output of a timer charger is terminated after a pre-determined time. Timer chargers were the most common type for high-capacity Ni-Cd cells in the late 1990s for example (low-capacity consumer Ni-Cd cells were typically charged with a simple charger). Often a timer charger and set of batteries could be bought as a bundle and the charger time was set to suit those batteries. If batteries of lower capacity were charged then they would be overcharged, and if batteries of higher capacity were charged they would be only partly charged. With the trend for battery technology to increase capacity year on year, an old timer charger would only partly charge the newer batteries. Timer based chargers also had the drawback that charging batteries that were not fully discharged, even if those batteries were of the correct capacity for the particular timed charger, would result in over-charging. A trickle charger is typically a low-current (usually between 5–1,500 mA) battery charger or one which has a trickle charging operating mode. A trickle charger is generally used to charge small capacity batteries (2–30 Ah). These types of battery chargers are also used to maintain larger capacity batteries (> 30 Ah) that are typically found on cars, boats, RVs and other related vehicles. In larger applications, the current of the battery charger is sufficient only to provide a maintenance or trickle current (trickle is commonly the last charging stage of most battery chargers). Depending on the technology of the trickle charger, it can be left connected to the battery indefinitely. Some battery chargers that can be left connected to the battery without causing the battery damage are also referred to as smart or intelligent chargers. Some battery types are not suitable for trickle charging. For instance, most Li-ion batteries cannot be safely trickle charged, and the damage caused can be enough to cause a fire or even an explosion. The most sophisticated types are used in critical applications (e.g. military or aviation batteries). These heavy-duty automatic “intelligent charging” systems can be programmed with complex charging cycles specified by the battery maker. The best are universal (i.e. can charge all battery types), and include automatic capacity testing and analyzing functions too. Since the Universal Serial Bus specification provides for a five-volt power supply (with limited maximum power), it is possible to use a USB cable to connect a device to a power supply. Products based on this approach include chargers for cellular phones, portable digital audio players, and tablet computers. They may be fully compliant USB peripheral devices adhering to USB power discipline, or uncontrolled in the manner of USB decorations. A power bank is a portable device that can supply power from its built-in battery through a USB port. Power banks are popular for charging USB charged devices. They can also be used as a power supply for various USB powered devices such as lights and small fans. They usually recharge with a USB power supply. The power bank includes a control circuit that both regulates charging of the battery and converts the battery voltage to 5.0 volts for the USB port. Some chargers for cells like 18650s and 26650 can also serve as a power bank. Although it is generally more cumbersome to carry such a charger with cells rather than a conventional power bank, this type of setup has the advantage of being able to charge cells for other uses. It also has the advantage that, when the cells are dead, they can be swapped for fresh cells for immediate use rather than having to be recharged first. Many powerbanks use the common 18650 size lithium-ion battery which may be user-replaceable. Capacity in Wh: Total power capacity measured by multiplying mAh by voltage. Capacity in mAh: mAh stands for milli Ampere-hour and measures the amount of power flow that can be supplied by a certain power bank at a specific voltage. Many manufacturers rate their products at 3.7 V, the voltage of cell(s) inside. Since USB outputs at 5 V, calculations at this voltage will yield a lower mAh number. For example, a battery pack advertised with a 3000 mAh capacity (at 3.7 V) will produce 2220 mAh at 5 V. Power losses due to efficiency of the charging circuitry also occur. Simultaneous charging and discharging: need to specify if the powerbank can be used while it is charging. Number of output USB ports: This specifies the number of devices that can be charged simultaneously. Output current rating: This specifies the current rating that it can charge maximum. The higher the number, the better the powerbank. This can vary from output port to output port. Also, some powerbanks don’t have dedicated high current ports, but will drop the output at all ports if the maximum total current output of the powerbank is exceeded. Input Current Rating: Input current rating is the amount of current the powerbank is able to draw at its maximum level while getting charged. Safety Protections: Over Voltage Protection, Over Charge Protection, Over Current Protection, Over Heat Protection, Short-Circuit Protections and Over Discharge Protections are the common safety measures observed with standard powerbanks. LED Indications: The Led glows as per indicating the amount of charging ability left with the powerbank. Some powerbanks have a line of LEDs, with the number of LEDs lit indicating state of charge. Other powerbanks may simply have one LED which changes color or flashes when the charge of the internal battery is low. Some power banks have a built-in wireless charging pad. Power banks are available in different capacity ratings. Although a standard exists for USB chargers, there are two areas of common incompatibility. and others. It is essential that the connectors on the device and charger match exactly, so that the correct polarity is used. Reversing the polarity between a battery and its charger is likely to cause battery failure and even charger failure. The failures may result in fire or damaged / destroyed equipment.. The charging port. This may be smart or dumb, and each in various current ratings. Compatibility varies and must be checked to maximize safety . A mismatched charger will charge more slowly, and sometimes not at all. Since a battery charger is intended to be connected to a battery, it may not have voltage regulation or filtering of the DC voltage output; it is cheaper to make them that way. Battery chargers equipped with both voltage regulation and filtering are sometimes termed battery eliminators. To recharge a fuel vehicle's starter battery, where a modular charger is used; typically an 3-stage charger. To recharge an electric vehicle (EV) battery pack; see Charging station. The charging device for Level 1 and Level 2 charging comes factory-installed and is called the “on-board charger”. It converts AC power to DC power that charges the battery in the vehicle.A 3.7 kW on board charger provides ~12 miles per hour of charge whereas a 7 kW on board charger provides ~22 miles per hour of charge. Chargers for car batteries come in varying ratings. Chargers that are rated up to two amperes may be used to maintain charge on parked vehicle batteries or for small batteries on garden tractors or similar equipment. A motorist may keep a charger rated a few amperes to ten or fifteen amperes for maintenance of automobile batteries or to recharge a vehicle battery that has accidentally discharged. Service stations and commercial garages will have a large charger to fully charge a battery in an hour or two; often these chargers can briefly source the hundreds of amperes required to crank an internal combustion engine starter. Electric vehicle battery chargers (ECS) come in a variety of brands and characteristics. These chargers vary from 1 kW to 7.5 kW maximum charge rate. Some use algorithm charge curves, others use constant voltage, constant current. Some are programmable by the end user through a CAN port, some have dials for maximum voltage and amperage, some are preset to specified battery pack voltage, amp-hour and chemistry. Prices range from $400 to $4500. A 10 amp-hour battery could take 15 hours to reach a fully charged state from a fully discharged condition with a 1 amp charger as it would require roughly 1.5 times the battery's capacity. Public EV charging stations provide 6 kW (host power of 208 to 240 VAC off a 40 amp circuit). 6 kW will recharge an EV roughly 6 times faster than 1 kW overnight charging. Rapid charging results in even faster recharge times and is limited only by available AC power, battery type, and the type of charging system. Non-isolated: the battery charger has a direct electrical connection to the A/C outlet's wiring. Non-isolated chargers cannot be used in parallel. Power Factor Correction (PFC) chargers can more closely approach the maximum current the plug can deliver, shortening charging time. Project Better Place was deploying a network of charging stations and subsidizing vehicle battery costs through leases and credits until filing for bankruptcy in May 2013. Researchers at the Korea Advanced Institute of Science and Technology (KAIST) have developed an electric transport system (called Online Electric Vehicle, OLEV) where the vehicles get their power needs from cables underneath the surface of the road via inductive charging, (where a power source is placed underneath the road surface and power is wirelessly picked up on the vehicle itself. Most mobile phone chargers are not really chargers, only power adapters that provide a power source for the charging circuitry which is almost always contained within the mobile phone. Older ones are notoriously diverse, having a wide variety of DC connector-styles and voltages, most of which are not compatible with other manufacturers' phones or even different models of phones from a single manufacturer. Users of publicly accessible charging kiosks must be able to cross-reference connectors with device brands/models and individual charge parameters and thus ensure delivery of the correct charge for their mobile device. A database-driven system is one solution, and is being incorporated into some designs of charging kiosks. There are also human-powered chargers sold on the market, which typically consists of a dynamo powered by a hand crank and extension cords. A French startup offers a kind of dynamo charger inspired by the ratchet that can be used with only one hand. There are also solar chargers, including one that is a fully mobile personal charger and panel, which you can easily transport. China, the European Commission and other countries are making a national standard on mobile phone chargers using the USB standard. In June 2009, 10 of the world's largest mobile phone manufacturers signed a Memorandum of Understanding to develop specifications for and support a microUSB-equipped common External Power Supply (EPS) for all data-enabled mobile phones sold in the EU. On October 22, 2009, the International Telecommunication Union announced a standard for a universal charger for mobile handsets (Micro-USB). Telecommunications, electric power, and computer uninterruptible power supply facilities may have very large standby battery banks (installed in battery rooms) to maintain critical loads for several hours during interruptions of primary grid power. Such chargers are permanently installed and equipped with temperature compensation, supervisory alarms for various system faults, and often redundant independent power supplies and redundant rectifier systems. Chargers for stationary battery plants may have adequate voltage regulation and filtration and sufficient current capacity to allow the battery to be disconnected for maintenance, while the charger supplies the DC system load. Capacity of the charger is specified to maintain the system load and recharge a completely discharged battery within, say, 8 hours or other interval. A battery charger can work as a DC power adapter for experimentation. It may, however, require an external capacitor to be connected across its output terminals in order to "smooth" the voltage sufficiently, which may be thought of as a DC voltage plus a "ripple" voltage added to it. There may be an internal resistance connected to limit the short circuit current, and the value of that internal resistance may have to be taken into consideration in experiments. Which electrical practices, and so which charger, are best suited for use depending entirely on the type of battery. NiCd cells must be fully discharged occasionally, or else the battery loses capacity over time due to a phenomenon known as "memory effect." Once a month (perhaps once every 30 charges) is sometimes recommended. This extends the life of the battery since memory effect is prevented while avoiding full charge cycles which are known to be hard on all types of dry-cell batteries, eventually resulting in a permanent decrease in battery capacity. Most modern cell phones, laptops, and most electric vehicles use Lithium-ion batteries. These batteries last longest if the battery is frequently charged; fully discharging the cells will degrade their capacity relatively quickly, but most such batteries are used in equipment which can sense the approach of fill discharge and discontinue equipment use. When stored after charging, lithium battery cells degrade more while fully charged than if they are only 40-50% charged. As with all battery types, degradation also occurs faster at higher temperatures. Degradation in lithium-ion batteries is caused by an increased internal battery resistance often due to cell oxidation. This decreases the efficiency of the battery, resulting in less net current available to be drawn from the battery. However, if Li-ION cells are discharged below a certain voltage a chemical reaction occurs that make them dangerous if recharged, which is why many such batteries in consumer goods now have an "electronic fuse" that permanently disables them if the voltage falls below a set level. The electronic fuse circuitry draws a small amount of current from the battery, which means that if a laptop battery is left for a long time without charging it, and with a very low initial state of charge, the battery may be permanently destroyed. Motor vehicles, such as boats, RVs, ATVs, motorcycles, cars, trucks, etc have used lead–acid batteries. These batteries employ a sulfuric acid electrolyte and can generally be charged and discharged without exhibiting memory effect, though sulfation (a chemical reaction in the battery which deposits a layer of sulfates on the lead) will occur over time. Typically sulfated batteries are simply replaced with new batteries, and the old ones recycled. Lead–acid batteries will experience substantially longer life when a maintenance charger is used to "float charge" the battery. This prevents the battery from ever being below 100% charge, preventing sulfate from forming. Proper temperature compensated float voltage should be used to achieve the best results. ^ "Recharger definition and meaning - Collins English Dictionary". Retrieved 26 March 2017. ^ "recharge - definition of recharge in English - Oxford Dictionaries". Retrieved 26 March 2017. ^ "A Guide to Understanding Battery Specifications MIT Electric Vehicle Team" (PDF). web.mit.edu. December 2008. Retrieved May 10, 2017. ^ "LM2576,LM3420,LP2951,LP2952 Battery Charging" (PDF). www.ti.com [date=July 2018. Retrieved July 29, 2018. ^ Dave Etchells. "The Great Battery Shootout". ^ Martin LaMonica, CNET. "Motion-powered gadget charger back on track." Jul 1, 2011. Retrieved Jul 1, 2011. ^ "Delayed at the station? Get pedalling to charge your phone". Connexion France. 4 April 2017. ^ "AN913: Switch-Mode, Linear, and Pulse Charging Techniques for Li+ Battery in Mobile Phones and PDAs". Maxim. 2001. ^ "Lead–acid battery sulfation". Archived from the original on 2007-04-02. ^ ""fast pulse battery charger" patent". 2003. ^ "The Best USB Battery Packs". ^ "Does a 3000 mAh portable power bank charge a 3000 mAh phone?". Android Authority. June 13, 2016. ^ "Global Electric Vehicle On Board Charger Market 2018-2023". Mobility Foresights. Retrieved 2019-04-09. ^ Fuji Heavy Speeds Up Recharging of R1e EV. Green Car Congress (2007-09-18). Retrieved on 2011-11-11. ^ Korean electric vehicle solution. Gizmag.com. Retrieved on 2011-11-11. ^ Charge your iPhone by spinning Voltmaker around like a mini helicopter. Today's iPhone. Retrieved on 2013-06-25. 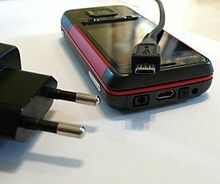 ^ China to work out national standard for mobile phone chargers. English.sina.com. Retrieved on 2011-11-11. ^ Mansoori, G. Ali; Enayati, Nader; Agyarko, L. Barnie (2015-11-05). Energy: Sources, Utilization, Legislation, Sustainability, Illinois as Model State. World Scientific. ISBN 9789814704021. Wikimedia Commons has media related to Battery charger.